Heissatopia: Blah, blah. Monday, Monday. Let me start by reassuring you (or myself) that we're going to be fine. We're hurtling on to the end of this cliff (Andrew's contract ends in August) and, all our hopes and dreams effectively quashed, soon we will nestle into Plan B (which honestly is probably more like plan Q by now) quite comfortably. Once we figure out health insurance, that is. We will soon be kicked off our current employer-based health insurance plan and only then can we browse the marketplace for a new plan. We can't set up new insurance before our old insurance ends so there will necessarily be a gap in coverage. I have been trying to tell myself that it will be fine. We're generally healthy people. And then Alexander spiked a fever of 103°F this morning, reminding me that even generally healthy people still need to call their doctor every once in a while. But I'm sure we'll figure all that stuff out. We have adjunct work lined up for the next year, which will provide an income stream trickle (we'll be taking a major pay cut), and we have a roof over our heads (thank goodness for Andrew's parents), so we'll be fine. On Monday we got word that Andrew was, yet again, not going to get a job he'd applied for. He was, we were told, at once over-qualified and under-qualified for the position. How that is even possible is beyond me (in short, we were told: his research/publication record was too stellar for an R2 school and he didn't have quite the amount of teaching experience they were looking for). Not getting this position was a little soul-crushing. Devastating, even. It was our final hope of having an actual job for next year. I can't even tell you how many jobs we've applied for, interviewed for, and have been turned down for. Actually, that's not true because we definitely have a spreadsheet for that (have you met Andrew?). Let's just say that we've been turned down a lot of times over the past two years of being "on the market." Usually we're fine. Usually we can see that it wasn't, perhaps, a good fit for us/them. Usually we can tell ourselves there are greener pastures. We return to the job boards and look at positions and start dreaming of new possibilities. And we're fine. Ninety-nine out of one-hundred times, we're fine. You might think I'm joking about the "out of one-hundred" part but remember that we have a spreadsheet and...it's definitely out of hundreds. Other times we are more emotionally invested and gathering our wits is harder. Sometimes we've been told we were the top candidate and to expect a formal job offer by the end of the week only to have the rug yanked out from under us. Other times we've spent a full week doing interview stuff—interviewing with a General Authority in SLC, meeting with every faculty member in the department, giving more than one presentation because some faculty member or other missed the first one—only to be completely ghosted. You know, things like that. Monday's nonstarter was part of the 1%. It was the final nail on the casket of the 2017–2018 job market. It meant our fallback plan was now our concrete plan for the next year. It smacked of rejection and failure and crumbling dreams. But life moves on, right? Andrew came home from work and helped prepare dinner and get the kids into bed. The kids mostly didn't care when we explained that Daddy was feeling morose because he hadn't gotten the job he'd been hoping for. Rachel understood that this was quite a crushing blow (and was rather crushed herself because this job would have meant moving back to Durham) and was sympathetic and did her best to make the evening go smoothly. The other kids pulled their regular bedtime shenanigans (as is to be expected from children). Our evening plans were to get all the kids into bed, take a few deep, cleansing breaths, and then head downstairs to unwind by playing games with Andrew's parents and his sister Emily, who is here visiting. It was going to be fine. And then Emily's phone rang and she took this call, of all possible places, in the entryway of our home, which for all intents and purposes is part of our living room. I should explain that we live on the second floor of the house and our living room is open to the entryway, which is two storeys high. There's a chandelier of sorts that hangs down over the entry, the staircase leading to our level is right behind the door, and one of our living room walls is a wood and wrought-iron banister. This open wall overlooks the entryway so anything that goes on in the entryway feels like it's happening in our living room. Emily had been up for a big promotion. The phone call she took was to inform her that the school board had voted to give her the promotion, tripling her current salary. Now, don't get me wrong. We are absolutely thrilled for Emily. This is something their family really needs and Emily has been stressing about this promotion (and making presentations to the school board and attending a lot of extra meetings and so forth) for quite some time. She was relieved and excited by the news and couldn't stop gushing about it to whoever'd called her to tell her the news, which I don't blame her for, but it felt insufferable in the moment, like rubbing salt into a wound—a wound Andrew was still licking. Let me tell you, trying to stroke his deflated sense of worth was made considerably more difficult with his sister exuberantly crying/laughing over her good fortune downstairs. Andrew said he could handle it, but I wasn't sure how I could (being so close to tears). It took quite a bit of bravery for us to even do so, but we grabbed each other's hands and made our way down to the kitchen where we found Emily, nearly bouncing from the effort of holding in her good news. To her credit, she didn't mention her promotion to us (which was good because we'd already endured her telephone conversation and her excited chatter about it to her parents (it's not that we were trying to listen in; it's just that our non-wall isn't soundproof on account of it being...air)). The tension, to me, was almost palpable but I didn't know what to do to relieve it. She was nearly bursting at the seams but was too embarrassed to say anything. We already knew but weren't sure if she knew that we knew. And we were hurting. But then my amazingly gracious husband broke the ice by kindly offering his congratulations. "What? Oh. Uh. Thanks," Emily stammered, blushing. And with that the tension, for the most part, melted away. We talked about Emily's new position for a while and soon the conversation took on a life of its own, flitting between this topic and that, some of them light and safe, some deep and uneasy. We played through a few rounds of Hand and Foot (a game I would lose royally) before turning in for the night. It ended up being an enjoyable evening. We're still hurting, but we'll be fine. Life will go on. There's work to be done, jobs to be applied for, dinner to be made, lessons to be learned. Life to be lived. The first thought that popped into my head with this scenario is a rather well-known scripture in Mormondom—Mosiah 18:9. We're supposed to "mourn with those that mourn; yea, and comfort those that stand in need of comfort!" I wanted it to be about me. I was mourning; I needed comfort. But then another idea came to mind: "Rejoice with them that do rejoice." I couldn't quite pinpoint where that thought came from (because I'm much better versed in the Book of Mormon than any other book of scripture), but it was easy to find; it's from Romans 12 (so close to one of my very favourite chapters, Romans 8). Both Romans 8 and Mosiah 18 are giving counsel on how to be a good church member, how to be a good person. The secret is: empathy. The secret is letting things not be about you. That's a hard truth, but a good truth. When Andrew was able to let things be not about him, when he was able to rejoice with Emily for a minute, it helped ease the tension lingering in the air. And, I think, it made it easier for Emily to in turn mourn with us. It opened up a channel of communication that had previously been a hurdle. It is impossible to rejoice for someone when you're stuck feeling sorry for yourself and it's terribly difficult to mourn with someone when you're busy gloating. By exercising a little empathy, by allowing things to be not about you for a minute, we can become "one body in Christ." That was a good thing to learn. Oh, phooey! 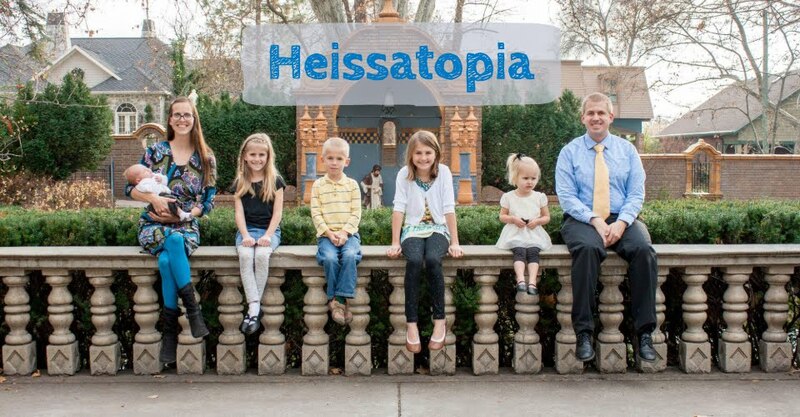 I would have loved having the Heisses back in Durham! Great lesson here about life not being all about ourselves; thanks for the reminder from the Bible! I love Romans 12. So much good wisdom in Paul's writings.